Guess they can't all be shoot-em-up action adventure stories. This Thanksgiving-themed story was one of those take-it-or-leave it offerings. They don't happen that often, thankfully. 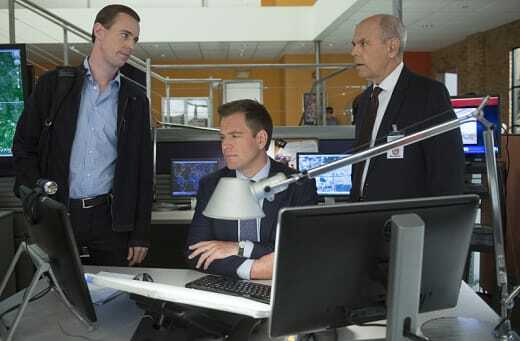 NCIS Season 13 Episode 10 gave us a two-plot story, one of which involved the hunt for the brother of a dying Navy Lieutenant. The search was urgent because the Lieutenant was suffering from leukemia, and he desperately needed a bone marrow transplant. He and his mother hoped the missing brother Sean would be a viable candidate. He wasn't, of course, and the only person who was turned out to be a military prisoner serving a life sentence for a double homicide. He initially offered to agree to donate his marrow, on the condition that he be immediately freed from prison. No one could make that happen, so he eventually agreed to do it mostly out of charity, and the chance to get paroled in 40 years. Meanwhile the missing brother turned out to be an informant for the FBI and Secret Service (cue Fornell), in their attempt to bring down a counterfeiting ring. The second plot was all about Ellie Bishop and her inability or unwillingness to process Jake's betrayal. Enter Gibbs and the lovely Lindsay Wagner as Bishop's mom, to provide assistance. It's hard to recall a less compelling case-of-the-week. When you don't know the character who's dying, it's difficult to get invested in him. So the viewer can be forgiven when the writer tries in vain to pluck those empathetic heart strings. As writing goes, the plots were very well laid out and easy to follow. That's consistent with most NCIS episodes and is therefore appreciated. There were some pluses to talk about, too. For instance, it was so good to see Fornell back with the gang again. His slightly irritated demeanor – particularly aimed at Tony – was fun to watch. There was one line from Tony that made me laugh out loud: So now that we're friends, can I call you Toby? That's vintage DiNozzo stuff right there. Another positive was Lindsay Wagner playing the role of Bishop's mom Barbara Bishop. Although to be honest, she's changed so much that I doubt we'd have recognized her had we not been forewarned that she was to be in the episode. Maybe it's the glasses. Anyway, it was so good to see her again. Unfortunately, it didn't actually work. I'm one of her biggest fans, but saw this as a mistake on the writer's part. Bishop is nowhere near being in the same league as Gibbs. Not now and likely not ever. She's a competent agent, and can hold her own for the most part, but she's still as green as can be. She might be a bit of a tomboy given the way her brother rough-houses with her. She hasn't suffered the losses that Gibbs has, however. Let's hope they drop that notion from here on in. And speaking of dropped notions, is it time for Jimmy to grow up yet? That overused "oh gee, did I say something stupid again is Gibbs behind me?" trope is beyond grating. It's now a broken record. I truly wish I could sit down with the show runner and tell him to get his writers to knock it off. Let's build some substance to that character. That meme is indicative of lazy writing. It's not just boring anymore, it's insulting to the viewership. There was another problem with this episode, albeit a minor one. Most of us immediately recognized Harry Van Gorkum who played Sean's apartment manager Alton Brinkman. This meant we knew he was going to play more than a minor role in the story and was likely going to be a bad guy. That's the problem with using well-known actors. The casting director would have been better off hiring an unknown person for that role. Most of these problems can be ignored in the interest of allowing ourselves to be entertained. Some things, however, act as virtual speed bumps. Like the scene where Abby reviews the four-camera casino film footage (using facial recognition software) to hunt for the man who preceded Sean in the money scam. It took her seven seconds to find the guy. This, out of supposedly hundreds of hours of film footage. Yeah, that doesn't happen in real life. It was beyond unbelievable. It was pure, shameless fantasy. Problems aside, we are now left with some important questions: what will Bishop do? She said marriage isn't something you give up on. She also said don't let a bad situation define who you are. The dialogue in this episode was great. Several key NCIS quotes were captured. You should check them out. It's too bad Barbara Bishop is married. I thought she'd have made an excellent partner for Gibbs. There will be a two week hiatus for the show. 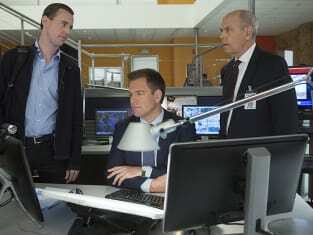 NCIS Season 13 Episode 11 will air on December 15. You can revisit this show when you watch NCIS online. Now it's your turn. What are your thoughts on this episode? Be sure to chime in, in the comments section below!